We have become so sophisticated with our packaging systems that we may be sealing our eventual doom. Help me worry about the destruction of our environment with all that plastic, glass, paper, and other gunk that my take hundreds of years to decompose. Much of the US doesn't even bother with recycling at all, but that's changing. There are different ways of approaching it. 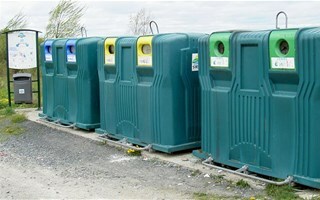 In France, some of the recycling depends not only on collection, but also roadside bins that take paper, glass, and metal/plastic in separate bins (there's some of that in the UK as well). It has a lot to do with educating the public and sometimes coercion, as in the fines for improperly sorting that were imposed in some places in the UK, but seem to be rolling back. In some parts of the US, the dual stream is different than the one described in the article. For instance in an area that has a large glass company, glass is one stream, everything else in the other. I think it makes sense to separate glass even if it can't go to a local company because as the article points out, broken glass contaminates just about all of the other materials. Maybe eventually humanity will grow up a bit and stop crapping in its own nest. If that ever happens I hope it's not too late. We have those in Brazil as well, there used to be roadside bins but it's been a while since I've seen any, probably because they would get stolen and/or vandalised. Now they're mostly confined to supermarket buildings. You can find used battery bins in universities and some banks as well. Every week a truck collects recyclable garbage from homes, and a lot of people living in my area seem to be selectively disposing of their trash based on what I've seen. At the university, there are bins for recyclables and non-recyclables too. That's all well and good but what happens to the trash when the cleaning staff collects it? They throw it all into one big container. I don't ever see public announcements regarding the importance of recycling. Education is key, especially when most of the population isn't very educated.